The St Nicolas Elegant Residence lives up to its name thanks to its flourishing Cypriot design, situated in the beautiful old city of Paphos. The hotel’s location puts it within easy reach of the centre of Paphos Town, with all its many attractions, great shopping locales and wonderful eateries. The hotel offers self-catering studios and apartments which equipped with quality facilities and a spacious kitchen, or for those who want to explore the local fare you can visit the resort’s nearby restaurants, too. The nearest beach is 10 minutes from St Nicolas Elegant Residence, but the on-site swimming pool is sure to keep guests cool, plus a gym and fitness centre, spa with sauna and massage treatments, tennis courts and even a children’s club – ensuring entertainment for all ages. The hotel can be reached from the Paphos International Airport within 20-30 minutes, making it easily accessible for visitors. 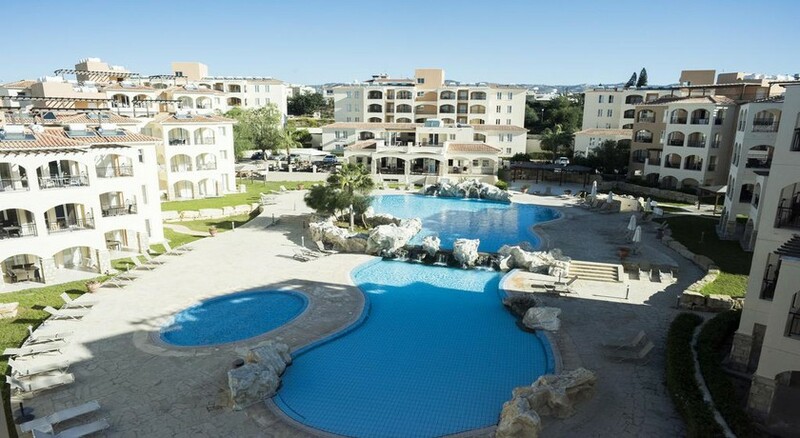 St Nicolas Elegant Residence is located just 17km from Paphos International Airport, a taxi journey will have you to the hotel in under half an hour. The nearest beach is just 4km away with a host of great restaurants within easy walking distance, too. Main area attractions are easily accessible via short taxi journeys and your hotel will gladly help you organise exciting day trips out to explore the surrounding resort. Choose from a variety of Studios, One Bedroom Apartments or Two Bedroom Apartments at St Nicolas Elegant Residence. Each space boasts an upmarket aesthetic, with a light and airy interior and comfortable furnishings. Facilities include a kitchen, kitchenware, ironing facilities, refrigerator and dining areas among other key features. Most rooms feature either a terrace or balcony with mountain views. 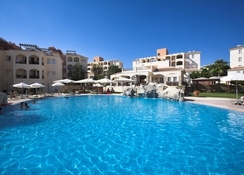 At St Nicolas Elegant Residence you’ll find a restaurant, bar and snack bar available to enjoy. Close by you’ll find great dine-out options also. Lava Tavern is a top spot if you wish to sample some of the local delicacies. Melania Restaurant provides excellent seafood and Mediterranean comfort food like moussaka. You’ll also find Indian, Steakhouse and Tapas, a little something for everyone. If you’re looking to relax during the evening, why not head to the nearby Paphos harbour area for a drink in one of the waterfront bars? With so many activities on offer, it’s easy to hang back at the hotel for a few days. If you’re looking for a cool down, there are both indoor and outdoor swimming pools to splash in, plus a waterpark. You can get even more active by hitting the on-site tennis court, fitness centre or the nearby golf course, located just a couple miles from St Nicolas Elegant Residence. Kids will love the playground, whil parents are sure to enjoy time spent in the relaxing sauna. When you do step out of the resort, Paphos Castle is a must-visit, this medieval fort and a popular Paphos attraction is not far from the hotel and offers a taste of history. The best way to tour the resort? Try a Segway tour of Paphos! The hotel was very average. The hotel was very average. The first room was awful, the bathroom door wouldn't shut etc but they moved us and the next one was of a good standard but really far away from reception.hotel staff weren't hugely attentive but polite. Pools were ok,the gym was laughable!! but there was zero entertainment,the restaurant food was awful (felt sorry for people all inclusive! )it was far away from the main strip but a nice area and you can get bus(including a 15/20 minute walk) or a cab for £4:50 (that gets a bit pricey if you want to go out more than once a day).overall if you get a good price it's a good deal.If the food in the restaurant&service was better I'd give it 4 stars. We had a nice break away. I was 7 months pregnant and so it did the job of “babymoon”. The facilities were okay, everything was just okay; nothing special. Food wasn’t great. Overall experience was fine.